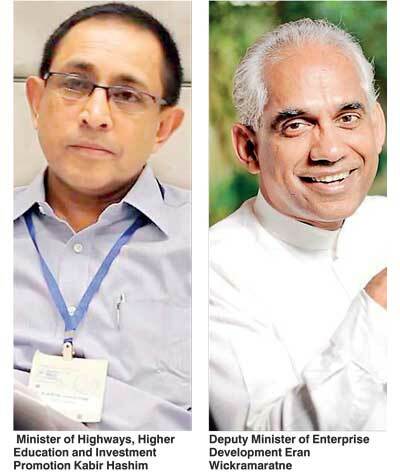 Eran Wickramaratne, the Deputy Minister of Enterprise Development, recently in an interview observed that the Government’s interest in State enterprise should be in policy and regulation. The general thinking worldwide nowadays, especially after the financial crisis is in line with Eran’s thinking that governments should not run commercial enterprises, no matter whether they are profit-making or not, and the Government should only limit its involvement to simply running essential public utilities. We all know it’s not the Government’s job to run businesses. It should act as a regulator and facilitator. Over the years successive governments have dumped hundreds of millions of rupees just to prop up loss making State-run corporations and as a result increased our public debt many times over. Airport and Aviation Services (SL) Ltd. Many of the institutions that have been vested with the new ministry have been moved out from other ministries, it may have been prudent however to have allocated them on the basis of similarity of subjects. For example the Central Bank of Sri Lanka, which regulates all banks and financial institutions, is under the Ministry of Economic Affairs and Policy Planning. Thus the monetary and financial policy of the Government has to be implemented by two totally different ministries. This may result in conflicts. It would have been prudent to have one cluster for all the State banks and the Central Bank. Similarly, other State-Owned Enterprises would have been better managed if they were allocated to ministries with related functions. This clustering of institutions with similar functions in one ministry will automatically ensure the concentration of experts in that field in that ministry. Management scholars such as Henri Fayol argued that principles such as specialisation of labour and the right span of control results in optimal organisational performance. The right mix would also enable the Minister in charge to take a long-term view and optimise the income generation potential of the institutions under his purview. Governments usually fail in business because politicians, not business executives, run Governments. Politicians generally make political decisions, not economic ones. Generally, cost management does not work well with bureaucracies. Indeed, when cost efficiencies are inescapable, bureaucracies often make cuts that inconvenience the public, generating political pressure thereafter to reverse the cuts. Usually, the CEO of a private sector company has the power to manage independently. He decides company policy, recruits the right people, and allocates resources very much as he thinks best to achieve the set objectives for the year. The board of directors generally does nothing more than reviewing the strategy, the risks, challenge some of the initiatives of the CEO and then ratify his moves, and will certainly fire him, if he fails to deliver the promised results. This allows a company to act quickly when needed. The next issue is the Government is regulated by the government. It is the Government’s job to make and enforce the rules that allow a society to function effectively. But it has a dismal record of regulating itself. Therefore, while we all know capitalism isn’t perfect. Indeed, to paraphrase Winston Churchill’s famous description of democracy, it’s the worst economic system except for all the others. But the inescapable fact is that often it is the profit motive and competition that help to keep enterprises lean, efficient, innovative, encourage meritocracies and stay customer-oriented, and this is often not the case with SOEs. Therefore, Eran certainly has a big challenge on his hands firstly, to ensure he finds the right talent and secondly to ensure the SOEs become less of a burden on the taxpayers and finally all SOEs eventually pay for their upkeep.